O.P.P officers avoid instant penalties! This a Bleeping Joke and is a smack in the face to anyone whos been charged with HTA 172! One wonders what loophole was used to avoid the siezure and suspensions that every other "Damn Street Racer"gets when charged under HTA 172! Just one more nail in the coffin for the Commissioner in my opinion! 2 OPP OFFICERS AVOID INSTANT PENALTIES after being charged under street-racing law Ontario Provincial Police Commissioner Julian Fantino says it won't happen again! 'The law is equal to all and so is accountability and I think it shows that we mean business,' says OPP Commissioner Julian Fantino. (Nathan Denette/Canadian Press) Ontario Provincial Police Commissioner Julian Fantino has said repeatedly that drivers who go 50 km/h over the speed limit will have their car seized on the spot and their licence suspended for seven days ÃƒÂ¢Ã‚â‚¬Ã‚â€ with no exceptions. But there were two exceptions, and both were OPP officers. Const. Michael Deyell and Const. Lloyd Tapp are the only two police officers charged under Ontario's street-racing laws. Both were on-duty, in marked cars, and charged by their colleagues. 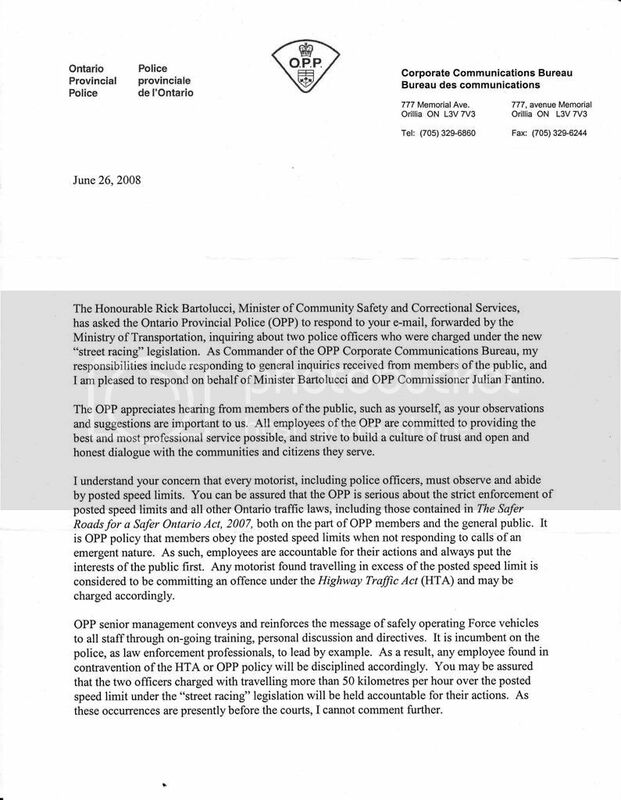 It's alleged Deyell was driving at 60 km/h over the speed limit in December 2007. His cruiser slammed into two horses, killing them. Deyell himself was injured and sent to hospital. Tapp is accused of driving his cruiser 50 km/h over the limit in March ÃƒÂ¢Ã‚â‚¬Ã‚â€ and was clocked by an OPP colleague. Under the new legislation, both officers should have had their licences and cars seized but that didn't happen. Fantino said that was a mistake. "The law is equal to all and so is accountability and I think it shows that we mean business," he said. "We're not playing favourites here. I mean, people know what the rules of the road are and I think that we have to be transparent. We have to be consistent and we have to be fair." Since new street-racing legislation came into effect last year, police have trumpeted the fact they've charged nearly 8,000 drivers. OPP Const. Dave Woodford said the law will be applied equally from now on. "I was with Commissioner Fantino over the weekend when he did say that they were looking at it differently. That the vehicles would be parked for seven days and that the officers' licenses would be suspended," said Woodford. "If this were to be repeated again, there would be a different outcome, I assure you," said Fantino. Tapp is on administrative duty, while Deyell is recovering and is expected to return to duty shortly. Both men have trials set for the fall. Police cars are exempt from being impounded. But they should've had their licence suspended, if they did not. I say lights on, giver bullets officer. However, if the officer is going "stealth" then there should be limits on their speeds. There is more to just HTA that we have to worry about. We have to follow the police services act as well of a vast array of internal policies. What a surprise, I bet officer Tapp is thankful for having his day in court! Unlike any other person charged under this cash grab, you're bent over on the side road, property siezed, license suspendid, fees and more fees! Is one of these officers lying or is it all just one big misunderstanding? Peterborough County OPP Const. Lloyd Tapp was found not guilty yesterday on charges of stunt driving and careless driving. The 43-year-old officer had strong words for the fellow officer who made the allegations against him and those that investigated the case. "Like I have been saying all along, the whole charge was a crock of lies," Tapp said. "The evidence you have heard today in court is a clear indication of the shoddy investigations of the Ontario Provincial Police." Questioning why charges were laid against him, Tapp said he is a visible minority who has made four claims to the Ontario Human Rights Commission against the OPP since 2005. "One might ask then, why were charges laid when such a strong prima facie case existed with a lack of evidence to even substantiate a charge?" he said. "What the public has heard today in court, the public should take heed to the type of so-called professional investigations and integrity of investigations by OPP." Tapp was charged April 8 with driving at least 50 km/h over the speed limit and careless driving on Highway 115 in Cavan Monaghan Township on March 25. Tapp was one of several Peterborough County OPP officers who agreed to provide security detail at Queen's Park during the release of the provincial budget March 25, court heard. OPP Const. Brenda Donnelly travelled with Tapp to Toronto in a marked cruiser, she testified. The two left the Peterborough detachment at about 3:37 a. m. and arrived in Toronto for briefing at about 4:45 a. m., she said. En route to Toronto, Donnelly said Tapp was driving 180 km/h along Highway 115, between 140 to 160 km/h on the 401 and was obeying the speed limit on the Don Valley Parkway. "We started going fast, excessive speeds," she told court. "The speedometer was pointing in my direction ... it was at the 180 km/h mark. We travelled that speed for quite a ways, most of the 115." Donnelly said she didn't say anything to Tapp because she had to work with him for the rest of the day. She made a formal police statement six days later, court heard. Defence lawyer William MacKenzie questioned why Donnelly didn't stop Tapp if he was driving at such speeds. 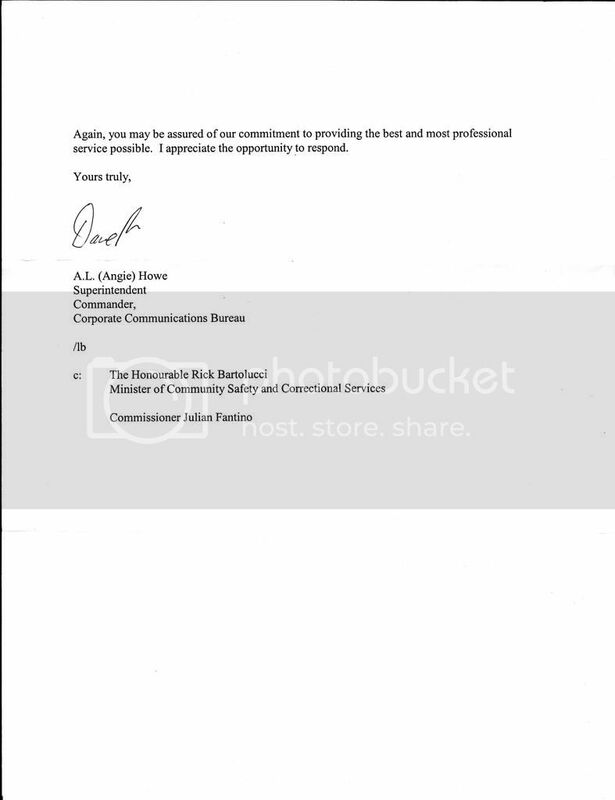 "On your evidence, you sat there quietly while a member of the police service broke the law. You failed to uphold your duties as a sworn officer, correct," MacKenzie asked. "Yes, yes I did," Donnelly replied. Tapp testified he wasn't paying attention to the speedometer but was going with the flow of traffic. He said he would never drive at such "ridiculous" speeds. "Personally, it's against my code of ethics to travel at that speed," Tapp testified. MacKenzie argued Donnelly was a poor witness who didn't take any notes of the incident. Her testimony also diverged from her police statement, court heard. She told police Tapp travelled 180 km/h the entire way to Toronto, MacKenzie noted. Given the 134 kilometres between the detachment and Queen's Park and the timeline Donnelly provided, MacKenzie said Tapp couldn't have driven more than 50 km/h over the speed limit. "The mathematics don't lie here," MacKenzie said. Justice of the peace Douglas Clark ruled the Crown did not prove its case beyond a reasonable doubt. I'm concerned as to why the Cst. Donnelley did not say anything to Tapp while he was allegedly driving an OPP cruiser at 180 km/h on a dark country road (lots of wildlife), then turned him in SIX DAYS later. If 180 km/h is really that dangerous, she should have said something right then and there. Same concept applies to my line of work: Someone's doing something unsafe, you don't just sit there and say nothing, you're OBLIGATED to speak up and stop it. Doesn't matter if you have to "work with" the guy for the next few hours or days. Tapp was found not guilty. Fine. Crown didn't prove it's case. Speed limit on Highway 3, where that incident happened, is 80 km/h. I believe she was lying, but he was still speeding and received no ticket. But think how poorply run the province is. They bring in cops from Peterborough. They spent 4 1/2 hours in salary just in return travel time for two officers. Then there was gas costs. Pathetic. Had he not been speeding it would've cost taxpayers even more in salary just for travel time. Radar Identified wrote: I'm concerned as to why the Cst. Donnelley did not say anything to Tapp while he was allegedly driving an OPP cruiser at 180 km/h on a dark country road (lots of wildlife), then turned him in SIX DAYS later. If this is the same Llyod Tapp who used to be the bouncer at the Alpine Motel on Kingston Road in the 80s, then not only would I not say anything while he was driving but I would update my will, get used to sleeping with my GLOCK under my pillow and buy a rottweiler before I reported him. I'm amazed Cst. Donnelly could get all that done in just six days. On another note, this case, R. v. Araujo, 2008 ONCJ 507 was insightful. The defence did a terrible job, but of note halfway through is that the prosecution submitted a factum (which isn't printed) acknowledging that 172 is a strict liability offence. They state that this is a standard Crown response to Charter challenges. I'd like to see a copy of that. Anyone? I haven't read it all yet but this is not a strict liability offence in any sense. The court is looking for excuses to keep this pathetic law alive. Strict lability offences are found in the Equipment Section under Part VI of the Act, and which regulates things such as lamps on vehicles; lighted streets; possession of red lights on vehicles; visibility of lights; brakes; windshield wipers; mirrors; speedometers; safety glass; mufflers; alarm bells; televisions in vehicles; and various others. The justice in this case claims itÃƒÂ¢Ã‚â‚¬Ã‚â„¢s the punishment that dictates whether or not it is a strict or absolute liability offence. What a dumbass. His ruling flies in the face of the Supreme Court case BC Motor Vehicle Act 1995. If the punishment dictated which class of offence it was then the BC Motor Vehicle Act case wouldÃƒÂ¢Ã‚â‚¬Ã‚â„¢ve been determined to be a strict liability offence because a term of imprisonment was attached. It was not a strict liability but an absolute liability offence. This is not language depicting a due diligence defence offence. It depicts an absolute liability offence only allowing the accused to challenge the evidence; but does not allow the accused to provide a defence to the offence. You are guilty upon the act of committing the offence. Courts have determined offences employing the ÃƒÂ¢Ã‚â‚¬Ã‚Å“no person shallÃƒÂ¢Ã‚â‚¬Ã‚Â or ÃƒÂ¢Ã‚â‚¬Ã‚Å“every driver shallÃƒÂ¢Ã‚â‚¬Ã‚Â formulation are interpreted as absolute liability offences: R. v. Hickey (1976), 13 O.R. (2d) 228. (speeding) R. v. Kurtzman (1991), 66 C.C.C. (3d) 161 at 172 (Ont. C.A. )-(failing to stop at a red light) and London (City) v. Polewsky (2005), 202 C.C.C. (3d) 257 (Ont. C.A. )-(speeding). 172. (1) No person shall drive a motor vehicle on a highway in a race or contest, while performing a stunt or on a bet or wager. Ms. Carter also incorrectly states that s. 128 provides for higher penalties than s. 172. Duh! After declaring s. 172 to be a strict liability offence, the justice than failed to inquiry whether or not the driver had an excuse to be speeding, i.e., the due diligence defence, before imposing his punishment. ÃƒÂ¢Ã‚â‚¬Ã‚Å“marked departure from the lawful rate of speedÃƒÂ¢Ã‚â‚¬Ã‚Â means a rate of speed that may limit the ability of a driver of a motor vehicle to prudently adjust to changing circumstances on the highway. If a driver can only be charged for a stunt when he's doing 50 kms over the speed limit, how can a driver be charged for racing or contest if he's doing less than 50 kph over? A marked departure only applies to the race contest offence. Going 50 kms over is clearly a marked departure from the lawful rate of speed, but the marked departure doesn't apply to he stunt offence. Therefore, a marked departure indicates the race contest is a mens rea offence, not a strict liability offence as the justice incorrectly ruled. The race contest offence is no different han the street racing offence in the Criminal Code, which is also a mens rea offence. The crown must prove the actus reus beyond a reasonble doubt and the mens rea beyond a reasonable doubt. The stunt offence is an absolute liability offence and does not require mens rea or provide for a due diligence defence. Last edited by lawmen on Sat Nov 15, 2008 5:24 pm, edited 4 times in total. Section 84 provides more evidence that when the Act articulates the "is guilty" or "are guilty" words ha it is an absolute liability offence. Section 84 is an absolute liability offence and s. 5 clearly indicates this fact. 75(4) A person having the control or charge of a motor vehicle shall not sound any bell, horn or other signalling device so as to make an unreasonable noise, and a driver of any motor vehicle shall not permit any unreasonable amount of smoke to escape from the motor vehicle, nor shall the driver at any time cause the motor vehicle to make any unnecessary noise, but this subsection does not apply to a motor vehicle of a municipal fire department while proceeding to a fire or answering a fire alarm call. I have to agree that 172 it is poorly written. THE COURT: "I've got to tell you, that client should be here to see all of this careful and able work." Re: O.P.P officers avoid instant penalties! So the Crown calls an officer of the court (police officer) who testifies under oath that she witnessed excessive speeds by the defendant for an extended period of time. The defendant (also an officer of the court) states that he never looked at his speedo and was just moving with the flow of traffic.... AND IT WORKED??!!! This is the same lame defense the majority of the speeding public uses and it NEVER works!! Just when friends and family thought I was done bellyaching, I'm all fired up again <Grrrrrrr>!! The Crown is taking a position that this is a strict liability offence. Given two witnesses, both officers with equal credibility (! ), the default judgement is with the defendant who gave the classic strict liability defence.